Wrapper around Sawyer's CommandLine class. Definition at line 98 of file CommandLineBoost.h. The command-line is not actually parsed here – its only saved by reference until run is called. Definition at line 106 of file CommandLineBoost.h. 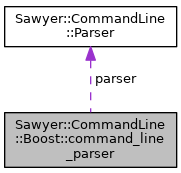 References Sawyer::CommandLine::Parser::errorStream(), Sawyer::Message::FATAL, and Sawyer::Message::mlog. The boost version of this method causes boost to capture values of switches that have not been declared. Although Sawyer is also capable of skipping over and accumulating arguments that look like switches but which have not been declared, doing so is fraught with danger. Imagine the synchronization and missing code problems that would result if a source code compiler took this same approach! Definition at line 123 of file CommandLineBoost.h. Parses the command line and return results. If the syntax is good, this also runs the "--help" switch if present. Definition at line 128 of file CommandLineBoost.h. Argument count saved by c'tor to be available during parsing. Definition at line 99 of file CommandLineBoost.h. Arguments saved by c'tor to be available during parsing. Definition at line 100 of file CommandLineBoost.h. Definition at line 101 of file CommandLineBoost.h.